One of my favourite hobbies is collecting old photographs. You can buy them fairly cheaply at antique stores, at post card fairs and through internet sites like ebay. The photos I like best are the ones that have a bit of a mystery to them. I particularly like unlabelled or partially labelled photos which I think might be able to be identified with a little detective work using online genealogical resources like the Ancestry.com website. There is often a lot of historical information in a photograph that you might not realise is there until you look at them closely. This is especially true for photos of streetscapes or buildings. Old photos can have a lot of resolution in them and, when scanned, can be blown up to reveal a lot of interesting detail. With careful cropping you can often find smaller pictures within the larger one. You can discover things you didn’t know were there. I bought the photo I feature here in a post card fair in Melbourne. It is what is called a ‘real photo’ postcard. It’s a photo taken by someone with their own camera and developed as a post card so it could be sent through the post to friends or family. It’s an original image, there might have been only a dozen or so printed. It’s usually unlikely to find that another copy of a photo like this has survived. If you own it you own the only one. This kind of post card started at the end of the 1800s and was most popular in the first few decades of the 20th century. The motor cars in this photo suggested it was taken in the early 1900s. The postal service back then had a morning and an afternoon delivery. The quickness and magic of receiving a family photo like this through the post in a day or too must have seemed like email or text messaging does to us today. When I bought this photo it was completely unlabelled. The back was blank except for the Kodak Australia marking which identified it as developed in Australia. I thought it was probably taken somewhere in Melbourne as that’s where I bought it. I thought the business signs within the photo might be the best way to identify it. The shop sign ‘Misses Andrews & Billett Lady Drapers and Costumiers’ looked promising but I could find nothing in the Melbourne street directories for the period in which it would have been taken. Nothing came up when I did a search in the Trove website and nothing came up in the Ancestry website using the slightly unusual name Billett either. 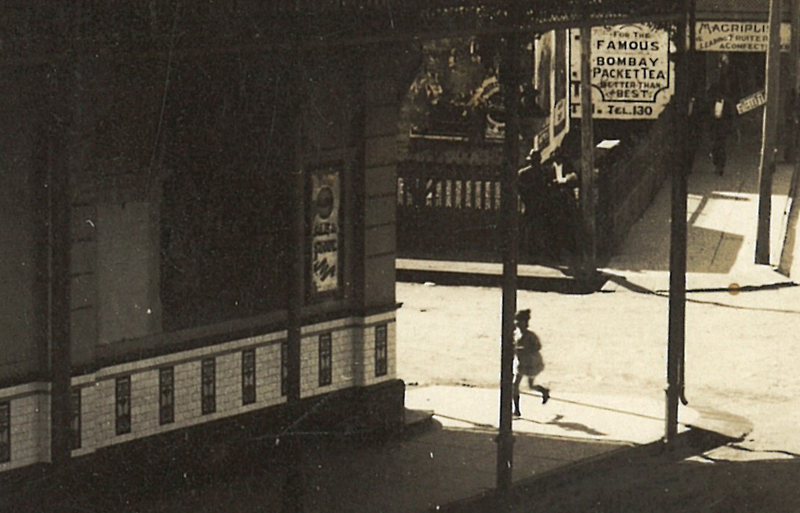 But it was the word Magriplis in the shop sign Magriplis Leading Fruiterer and Confectioner that identified the photo. I hadn’t realised that that was a family name when I first looked at it and, when searching, I discovered that families with the name Magriplis, only seemed to be living in Western Australia and the Northern Territory. 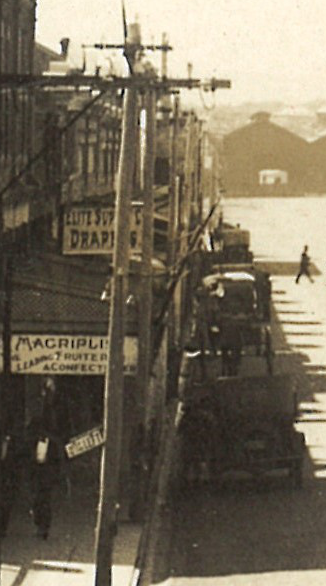 Using Ancestry.com website I found that the Magriplis fruit shop was on Marine Terrace, the main road of Geraldton, Western Australia. 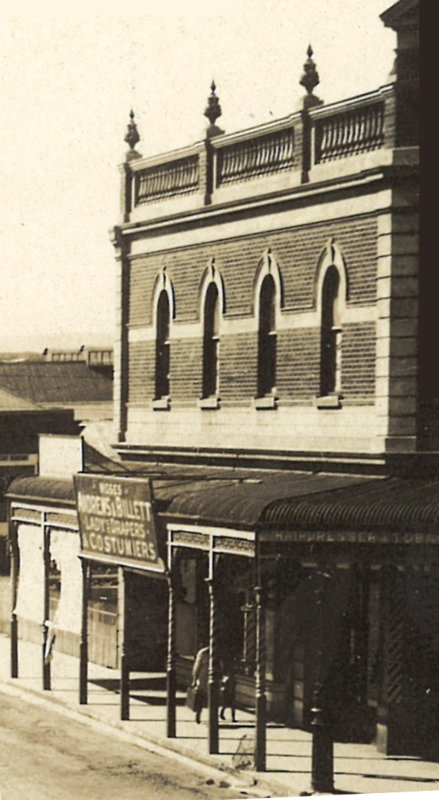 Doing a Trove search using the words ‘Andrews & Billett Drapers and Costumiers Geraldton’ also brought up a newspaper article that identified this same location. I had a look at a ‘Streetview’ of Marine Terrace, Geraldton today from ‘Google Maps’ I could see what was left of the Andrews & Billett building, which looked it had been extensively renovated over the years. It was on Marine Terrace, this verified the location of the post card. 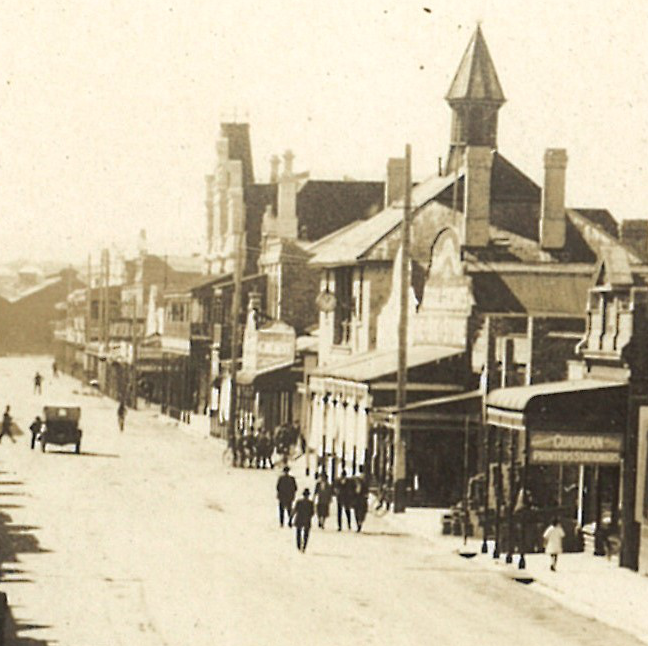 A digital image of this photo has been donated to the collection of the Geraldton Regional Library. If anyone would like a copy please contact the friendly librarians at that library. A fascinating detective story. Thanks for sharing your insights and the steps in your photo research process. Thank you for your time and effort to summarize everything for the audience,. I am truly learning from your experience. Thanks again for useful resource.